I am always ready to start the Christmas baking too early to actually start the Christmas baking. Last year (at exactly this time, I see), I was stirring up a batch of Wonderballs, no-bake peanut butter-oatmeal concoctions that we keep in the fridge. They are an excellent transitional snack, whether the gap you’re trying to bridge is from lunchtime to dinner, or from Thanksgiving to Christmas! This year, I figured it wasn’t too early to start in on some of the Christmas gift candy-making. Every year seems to add a few more people to the list of folks who have helped us through the months, from the boys’ many teachers to the guy who delivers the Sunday New York Times, and while I make batches and batches of cookies during the holidays to share with folks who come over, I make candy to give away. It keeps better than cookies, it’s less fragile, and I can produce it quickly in great volume. Now candied orange peel might not be at the top of everyone’s favorite candy list, and I think that’s probably because too many people have been subjected to too much bad fruitcake studded with plasticky candied citrus. 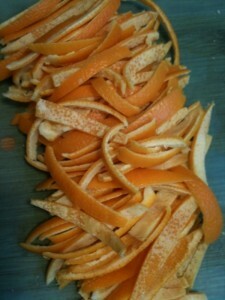 Fresh candied orange peel is a revelation: it’s delicious, with all the citrus flavor concentrated in a couple tender bites; it’s sparkly and beautiful; it’s also (except for one tedious step) easy, quick, and cheap. What’s not to like? I’ve been making it for years, and now it’s one of the first things Ben asks for when we start to talk about Christmas cooking, so I can’t resist making it for him. Add water to cover and simmer for 30 minutes. Drain, cover with fresh cold water, and simmer until tender. 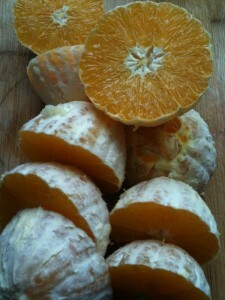 Drain, refresh under cold water, and then remove the remaining pulp or pith by scraping it away with a spoon or paring knife. This is the tedious part of the process and it’s a little too delicate to delegate to the kids yet, but I hope to next year. 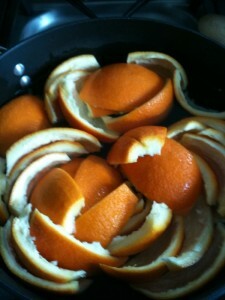 Cut the peel into 1/4″ wide strips. Stir over low heat until the sugar is dissolved. 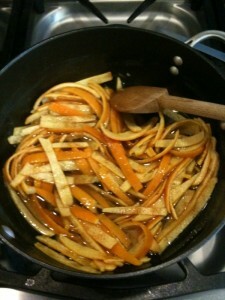 Add the fruit peel and cook very gently over low heat until most of the syrup is absorbed. Cover and let stand overnight. Bring to a simmer again, then use a slotted spoon to transfer the peel to a baking pan lined with parchment and sprinkled generously with granulated sugar. 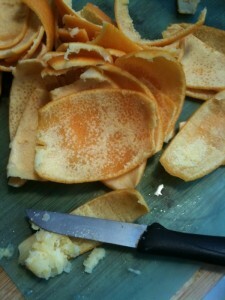 Use tongs to toss the citrus peel in the sugar until well coated. Let dry for at least an hour. 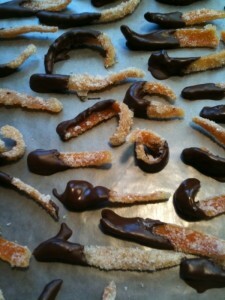 You can stop there, or you can go one more step and dip the candied peel into chocolate. This is something the kids could do, if you trust them not to eat every other piece. Melt or temper half a pound of bittersweet chocolate (since I store these in the fridge, I don’t go to the trouble of tempering, but go ahead if you’re feeling fancy). Dip the end of each piece of peel in the chocolate and let dry on sheets of waxed paper. Store the finished candy between layers of wax or parchment paper in an airtight container in the fridge for up to 4 months. Finally, don’t toss the sugar you used to coat the candied peel; it offers a nice orange-y tang to any baked goods or even your next cup of tea. 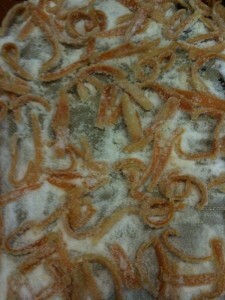 My mom LOVES candied orange peel. When I was a kid I thought she was nuts, but now, given the opportunity, I can eat a lot of it. Yum. Delicious! I think I overcooked mine, but who cares? 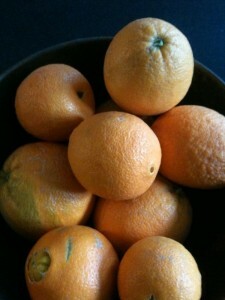 They’re pleasantly sticky and seriously addictive. I would suggest that anyone else trying this keep a small dish of cold water available to dip your fingers in when you moving the strips from the pot to the sugar toss at the end. Hot sugar hurts. Ouch, Liz, sorry about the burn! I use a slotted spoon for that step.